Viking Baseball Goes Big on Sr. Night With An 11-0 Victory Over Reagan - PLAYOFF BOUND AGAIN!!! After a decisive Sr. Night victory over Reagan the Viking Baseball Program is gearing up for the post season! Please congratulate the guys on a job well done. Bi-District Playoff game has been set for May 4th at Nelson Field 7 PM. What an awesome display of grit and teamwork Friday night at Nelson Field. After going down 5 runs in the first the guys came together and pulled off a dramatic comeback rallying to a 10-9 win! Check out the link below. Last night both JV Baseball teams traveled to Lampasas for a double header against the Badgers. Both teams were successful in defeating the badgers, JVA- 12-6 and JVB 7-3. JVA improved their record to 2-0 on the season while JVB picked up their first win in their season opener. The effort was led at the plate by Leonel Ramirez, Alexander Perez, Angel Vierra, Alex Santos, Axel Polanco, MArk Luna, and Alberto Miereles. Stellar Pitching performances came from Brandon Kruser, Leonel Ramirez, Axel Polanco, and Emilio Pimentel. The JV will look to continue its success this Saturday against LBJ and Crockett. 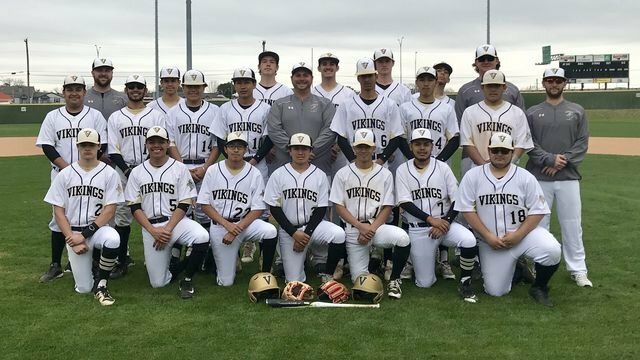 Yesterday our Viking JV A baseball team traveled out to Lago Vista for their first official game of the season. Despite some less than ideal playing conditions, our boys were able to come away with an opening day victory defeating the "other" Vikings 3-0. The win came behind a stellar pitching performance by freshman Oscar Peralta who struck out 8 batters in 4 innings of work. Axel Polanco sealed the shutout with 3 strikeouts in one inning. Oscar and Axel threw a combined no-hitter, a rare feat at any level. If you see these young men give them a pat on the back.